Pain after surgery is a maladaptive response. Acute postoperative pain is an important predictive factor for chronic post-surgical pain, which is observed in 10–65% of patients after surgery. Therefore controlling pain after surgery is very important. Reducing postoperative pain will result in more patient satisfaction, less complications due to immobility and decreased hospitalization periods. Unrelieved postoperative pain has important consequences in a variety of dimensions. Physically, extended periods of unrelieved severe pain can result in physiologic changes that include pituitary-adrenal activation which, in turn, may produce a diminished immune response. There is also sympathetic activation in association with pain, which may result in cardiovascular, gastrointestinal and renal changes. In addition, unrelieved acute post-operative pain results in avoidance of movement and ambulation on the part of patients which may often be key elements in their early surgical recovery. Acute postoperative pain is followed by persistent pain in 10–50% of individuals after common operations, such as groin hernia repair, breast and thoracic surgery, leg amputation, and coronary artery bypass surgery. Since chronic pain can be severe in 2–10% of these patients, persistent postsurgical pain represents a major, largely unrecognized clinical problem. The effect of aggressive, early therapy postoperative pain should be investigated, since the intensity of acute postoperative pain correlates with the risk of developing a persistent pain state. In medical practice, opioids analgesics are generally used for controlling postoperative pain. Opioids analgesics can cause many complications, including nausea, vomiting and pruritus. It needs consideration of other methods to control pain after surgery. This inefficacy necessitates the consideration of other methods to control pain after surgery, such as preemptive analgesia. After total knee replacement some patients do not improve adequately during routine rehabilitation procedures and physical therapy treatment. Even many weeks or months after surgery, far beyond the physiological healing time, they suffer from persistent pain, as well as functional limitations, which negatively impact quality of life. Pain continues for at least 3 months postoperatively is defined as chronic postsurgical pain. The prevalence of chronic postsurgical pain following total knee replacement is approximately 20%, but reportedly varies between 5% and 44%. Up to 15% of patients will report severe levels of pain after surgery. Not surprisingly, there is a growing body of research concerned with identifying predictors of chronic postsurgical pain following total knee replacement. Orthopedic surgery is increasingly being performed in an ambulatory setting. Some procedures, such as carpal tunnel release (more than 90% of cases) and arthroscopic meniscectomy of the knee, are largely being performed on an ambulatory basis. Orthopedic surgery is considered one of the most painful procedures during the postoperative period. The pain felt upon returning home is the most common complaint of patients and the main cause of failures in ambulatory care. The implementation of enhanced recovery pathways and multimodal analgesic techniques has already been shown to reduce hospital costs and length of stay for patients undergoing total knee and total hip arthroplasties. The annual incidence of total shoulder arthroplasties continues to rapidly increase. As this surgical population continues to rise, hospital systems have started to shift many of these surgeries from an inpatient to an ambulatory setting. However, key to such programs is sufficient pain control that facilitates rehabilitation and recovery with minimal side effects. Adequate pain relief reduces the surgical stress response, thus reducing morbidity and facilitating postoperative recovery. There is an ongoing search for a simple means of providing such patients with postoperative analgesia that has a prolonged duration of action, is easy to administer and has no serious adverse effects. Managing postoperative pain by targeting peripheral receptors is an important means of achieving this, intra-articular administration of drugs being an example of this approach, providing local analgesia with minimal systemic adverse effects. 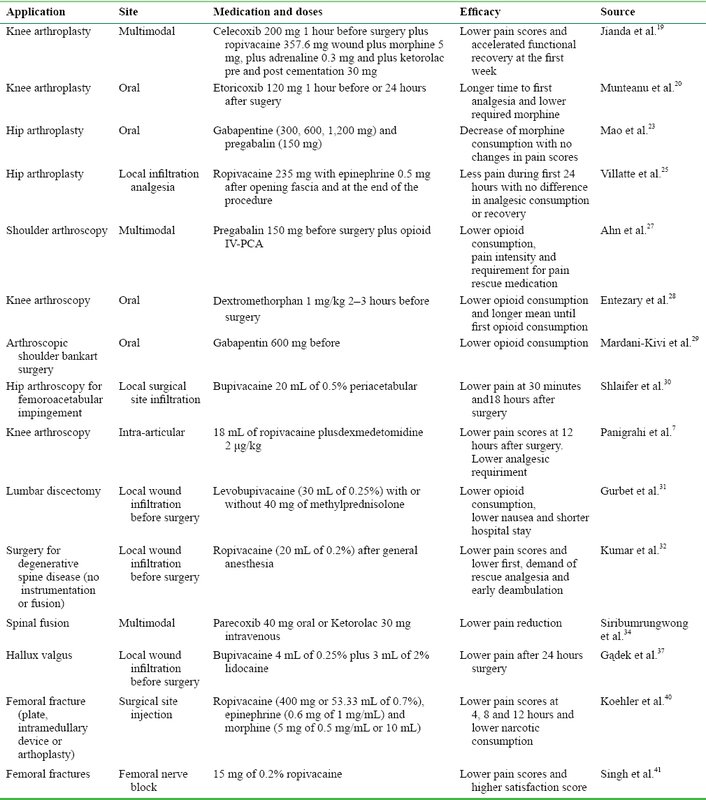 In a narrative review of literature, the use of preemptive analgesia in orthopedic surgery with a great variety of medications and interventions is examined. A search with the key words: “preemptive analgesia”, “orthopedic surgery” and “post-surgical pain” was conducted in online database PubMed, EBSCO, Elsevier (ClinicalKey), SpringerLink and OVID. Then selected articles from 5 years relevant with the application of preemptive analgesia in orthopedic surgery was analyzed. Finally we show some interventions with the outcomes and the challenges and new investigations suggested. It refers to the administration of analgesic treatment before surgical insult (incision) or tissue injury. It is based on the concept that central and peripheral sensitizations are the mayor causes of hypersensitivity to pain after injury. The aim of preventive analgesia is to minimize a sensitization induced by noxious stimuli arising intraoperatively and postoperatively. It has two characteristics. First it is able to reduce the degree of postoperative pain or the amount of analgesic consumption compared with another treatment, placebo, or no treatment. Second, the effect on pain control of the intervention extends beyond its analgesic effect. It begins before surgery, with the goal of preventing peripheral and central nervous system sensitization secondary to the surgical incision and surgical tissue manipulation. The concept is based on preventing the production of inflammatory chemicals during a painful stimulus, thus avoiding the sensitization of peripheral and central nociceptors. The sensitization of these nerve fibers lowers the paint threshold and contributes to hypersensitivity to innocuous stimuli during the postoperative period, leading to chronic neuropathic pain. It can be defined as the administration of two or more drugs that act by different mechanisms for providing analgesia. It may be administered via the same route or by different routes. It include opioids, local anesthetic techniques (local infiltration, intra-articular, peripheral nerve blocks and neuraxial blocks, NSAID, COX-2 specific inhibitors, steroids, NMDA antagonists, alfa-2 agonists and anticonvulsants). The goal of multimodal analgesia is to provide superior postoperative pain control through the simultaneous modulation of several pain pathways while minimizing the undesired adverse effects of excessive narcotic consumption, which can result in nausea, vomiting, sedation, ileus, respiratory depression and pruritus. Most multimodal protocols focus on oral analgesics, which may be started several days before surgery and usually are combined with oral opioids. The ultimate goal is to provide adequate pain relief without using intravenous opioids. The use of a single preemptive dose of IV ibuprofen with a dose of 400 mg 30 minutes before surgery reduced 24-hour opioid consumption and was effective in the emergence of lower pain scores in the postoperative period compared with placebo. In addition, IV ibuprofen significantly reduced rescue analgesic use. This was in patients who underwent laparoscopic cholecystectomy. The administration of preoperative gabapentin reduced the consumption of opioids during the initial 24 hours following surgery. The reduction in postoperative opioids with preoperative gabapentin increased postoperative somnolence, but no significant differences were observed in nausea and vomiting incidences. It is more beneficial in mastectomy and spinal, abdominal, and thyroid surgeries. When compared the effect of preemptive use of oral gabapentin (600 mg) and pregabalin (150 mg) for acute post-operative pain after surgery in patients undergoing elective gynecological surgeries found a significantly longer mean duration of effective analgesia in pregabalin (535 minutes) group compared with other groups (placebo 151 minutes, gabapentin 302 minutes). The mean numbers of doses of rescue analgesia in the first 24 hours in placebo group was 4.7, gabapentin group 4.1 and pregabalin group 3.9. Multimodal preemptive analgesia using a combination of acetaminophen (15 mg/kg), dextromethorphan (0.3 mg/kg), naproxen (7 mg/kg) and pregabalin (2.5 mg/kg) as preemptive analgesia can decrease the need for opioid analgesics and improve pain control for radical neck dissection surgery patients. This was in patients who underwent radical neck dissection in a cancer institute. The effect of preemptive analgesia on the level of postoperative pain was studied in women undergoing surgery for breast neoplasm (including simple mastectomy, modified radical mastectomy, breast-conservation surgeries, wide local excision and sentinel lymph node biopsy). With four groups (metamizole 1 g, ketoprofen 100 mg, tramadol 100 mg or placebo) with application 30 minutes before induction of anesthesia was found that tramadol and ketoprofen demonstrated effectiveness in pain control and heart rate was not seem to be significantly linked with the intensity of experienced pain. Melatonin has been suggested as a new natural pain killer in inflammatory pain and during surgical procedures. In patients undergoing cesarean section under spinal anesthesia were randomly allocated to one of the groups to receive 3 mg of melatonin, 6 mg of melatonin or placebo 20 minutes before spinal anesthesia and there was no difference statistically significant. Pentazocine, which acts as an agonist of kappa receptors and partial agonist/antagonist of M receptors, has been widely used to treat moderate to severe pain. It has an adequate analgesic effect with relatively weak respiratory depression and addiction. When comparing pentazocine (P group) (0.5 mg/kg 10 minutes before surgery) with placebo in patients undergoing laparoscopic cholecystectomy was found that P group had lower visual analogue scale (VAS) scores at 2, 4 and 8 hours compared with placebo, with less tramadol doses and no significant changes in mean blood pressure and heart rate in P group. Dexmedetomidine, a potent alfa-2 adrenoceptor agonist, is approximately eight times more selective towards alfa-2 adrenoceptor than clonidine. When dexmedetomidine is given intravenously, it has a significant opioid sparing effect as well as decreased requirement of anesthetic agents. In patients undergoing for elective abdominal hysterectomy under general anesthesia using dexmedetomidine as coadjuvant to local wound infiltration with 30 mL of 0.25% bupivacaine at the end of the surgery showed a reduction in post-operative morphine requirement when compared with bupivacaine wound infiltration only. Transcutaneous electrical nerve stimulation is a non-pharmacological method of analgesia. It is approved by the US Food and Drug administration (FDA) and is a fast, safe, non-invasive, and inexpensive form of physical therapy. In a study conducted in Iran in patients with unilateral inguinal hernia undergoing surgery with two groups one treated with transcutaneous electrical nerve stimulation 1 hour before surgery while the placebo in control group found lower pain rates at 2 and 4 hours after surgery and no significant differences in mean pain intensities at 6 and 12 hours. Total knee arthroplasty is one of the most commonly performed procedures while postoperative analgesia remains as a concern. A meta-analysis of randomized control trials indicated that local infiltration analgesia provided better analgesia than regional blockade at rest and preserved quadriceps function in the immediate postoperative period, which may be beneficial to early functional recovery. And its safety profile is reliable. Preemptive analgesia (celecoxib 200 mg 1 hour before surgery) added to multimodal analgesic regime (ropivacaine 357.6 mg, morphine 5 mg, adrenaline 0.3 mg, ketorolac 30 mg pre and post cementation in surgical site) improved analgesia, reduced inflammatory reaction and accelerated functional recovery at the first week postoperatively in patients under knee arthroplasty, but not improved long-term function. When exploring etoricoxib (120 mg) analgesic benefit in total knee arthroplasty under spinal anesthesia preoperative (1 hour before) vs. postoperative (24 hours after) in a randomized double blinded and placebo trial, it was found that both etoricoxib required less quantity of morphine than placebo, and even less in the preoperative group. There was longer time to first analgesia compared with placebo in the preoperative group but no significant difference between both etoricoxib groups. There was no difference in side-effects among the three study groups and there were no serious adverse effects of etoricoxib. Another study comparing the length of stay short-term pain control, and patient's satisfaction at 1 month between local infiltration analgesia (LIA) combined with femoral nerve block (FNB) and FNB only in patients undergoing total knee arthroplasty found no differences in demographical data and preoperative VAS score in both groups. LIA group had a lower VAS score at 36 hours after surgery, but these differences were not maintained at the 15-day follow-up. The patient satisfaction was comparable between groups. Patients with LIA had no additional complication. Multimodal infiltration of local anesthetic provides effective control of pain in the patients undergoing total knee arthroplasty. When comparing traditional multimodal infiltration (100 mg bupivacaine, 5 mg morphine sulphate, 0.6 mg epinephrine, and 30 mg ketorolac) with posterior capsular infiltration was found no statistically significant differences between the groups in VAS pain scores at first 24 hours post-operatively, the use of morphine in the patient controlled analgesia, blood loss and length of stay. A meta-analysis of randomized controlled trials in patients undergoing total knee arthroplasty compared LIA with regional blockade (RB) for postoperative analgesia founding that patients managed by LIA significantly lowered numeric rating scale (NRS) score at rest when compared with those managed by RB. Difference of morphine consumption was not significant between the two groups. In terms of early functional recover the LIA group showed more straight leg raise on the first postoperative day, better range of motion within 1 week, and comparable knee society score. Length of hospital stay of the LIA group was marginally shorter than that of the RB group. Risk of side effects and complications were comparable between groups. LIA provided better analgesia than RB at rest and preserved quadriceps function in the immediate postoperative period, which may be beneficial to early functional recovery. Meta-analysis comparing the efficacy of preoperative administration of gabapentin and pregabalin in patients after total hip arthroplasty found in studies involving 769 patients that treatment with gabapentin or pregabalin can decrease the cumulative morphine consumption at 24 hours. Gabapentin or pregabalin produced no better outcome than placebo in terms of VAS score with rest at 24 hours, and with rest at 48 hours. There was no statistically significant difference between the groups with respect to the VAS score with rest at 24 hours postoperatively and 48 hours postoperatively. Gabapentin decreased the occurrence of nausea, but there was no significant difference in the incidence of vomiting, dizziness and pruritus. In total hip arthroplasty and total knee arthroplasty patients meta-analysis from randomized controlled trials evaluating the efficiency and safety between LIA and intrathecal morphine for pain control in total knee and hip arthroplasty demonstrated that there were significant differences in terms of postoperative pain scores at 24 hours during rest and mobilization following total knee and hip arthroplasty. LIA provided superior analgesic effects within the first 24 hours compared with intrathecal morphine following surgery and there fewer adverse effects in LIA group. Morphine consumption was similar in two groups. Total hip arthroplasty is considered a painful procedure with significant blood loss. A study compared VAS score, hospital stay and analgesic consumption in patients undergoing total hip arthroplasty using LIA with ropivacaine (235 mg) with epinephrine (0.5 mg) after opening fascia (anterolateral approach) and at the end of the procedure versus placebo finding that LIA had significantly less pain during the first 24 hours, with no significant differences in terms of analgesic consumption, early and delayed recovery or bleeding between groups. Patients undergoing primary shoulder arthroplasty were randomized to interscalene brachial plexus blockade or intraoperative soft-tissue infiltration of bupivacaine liposome injectable suspension. The narcotic consumption over 24 hours after surgical procedure was no different in both groups; intraoperative narcotics were significantly lower in the blockade group compared with suspension group. The mean VAS pain score was significantly lower in the blockade group than in the suspension group at 0 hour, and at 8 hours but it was different at 16 hours postoperatively (lower in the blockade group). The VAS pain scores were higher in the blockade group at 24 hours compared with the suspension group. The use of pregabalin 150 mg as a single preemptive dose before arthroscopic shoulder surgery (bankart repair and rotator cuff repair) as an adjunct to an opioid-based IV-PCA resulted in significant beneficial effect in terms of reduction in opioid consumption, pain intensity, and requirement for pain rescue medication. The occurrence of complications and related to the multimodal analgesic regimen, including sedation, headache, dizziness, and blurred vision, were similar between the groups during the study period. Also, the incidence of postoperative nausea was similar between the groups, and none of the patients experienced postoperative vomiting. Studies have shown that NMDA receptor plays an essential role in postoperative pain. It seems that the use of NMDA receptor antagonists such as Dextromethorphan intensifies the analgesic effects of opioids. In a double blind randomized clinical trial in patients undergoing knee arthroscopy participants were allocated in two groups of dextromethorphan (syrup 1 mg/kg 2–3 hours before operation) and placebo showing significantly lower opioid consumption in the group of dextromethorphan and a longer mean time until first opioid request in the same group than placebo. A triple blinded randomized clinical trial with patients following shoulder bankart arthroscopy were randomly divided into two groups either taking gabapentin 600 mg or placebo showing that pain intensity were not significantly different between both groups. The opioid consumption, however, was significantly reduced in gabapentin group at both 6 and 24 hours. Dizziness and sedation were similar in both groups. Nausea and vomiting were significantly lower in the gabapentin group only at 6 hours but similar at 24 hours. In patients undergoing hip arthroscopy to treat symptomatic femoroacetabular impingement was found that preemptive periacetabular 20 mL of bupivacaine 0.5% injection was superior to intra-articular injection in pain reduction after surgery at 30 minutes and 18 hours postoperatively. However total analgesic consumption over the first 2 post-operative weeks and VAS pain measurements were not significantly affected. Patients who underwent knee arthroscopic surgeries such as diagnostic arthroscopy, reconstruction of anterior cruciate or posterior cruciate ligaments or both, meniscectomy and so on under spinal anesthesia were selected for an study were they compared the use of intra-articular ropivacaine (20 mL), ropivacaine plus dexmedetomidine (18 mL and 1 μg/kg body weight) and ropivacaine with a higher dose of dexmedotomidine (18 mL, 2 μg/kg body weight) showing lower pain scores for the first 12 postoperative hours in the last group as well as total analgesic requirement significantly lower. Many patients with lumbar disc surgery experience postoperative back pain. Pain intensity peaks during the first postoperative hours and usually declines over the following 2 days. Inadequate management of postoperative mild or severe pain leads to several pathophysiological changes in the pulmonary and cardiovascular systems. In fact pain can cause an increase in sympathetic tone, which impairs neuroendocrine and metabolic catabolism, and may impair muscle functioning. In a prospective, randomized, controlled trial comparing of different protocols of local tissue infiltration with A: levobupivacaine (30 mL of 0.25%), B: levobupivacaine-methylprednisolone (30 mL of 0.25% levobupivacaine and 40 mg of methylprednisolone) and C: placebo at the surgical site before incision and at closure for pain relief after lumbar discectomy showed in all four treatment groups better results than the control group for most parameters. The treated groups lowered parenteral opioid requirements after surgery, lowered incidences of nausea and shortened hospital stays. The data suggest that preemptive infiltration of the wound site with levobupivacaine alone or combined with methylprednisolone provides effective pain control with reduce opiate dose after unilateral lumbar discectomy. Preemptive analgesia with a single epidural injection of ropivacaine (20 mL of 0.2% after the administration of general anesthesia) in patients undergoing surgery for degenerative spine disease (no instrumentation/no fusion) resulted in a delay in the average time to the first demand for rescue analgesia in the study group suggesting better postoperative pain relief than in the control group (no preoperative analgesia). The study group also showed earlier ambulation with minimal adverse effects. The requirement for intraoperative fentanyl was higher in the control group. Kim et al. showed that liposomal bupivacaine is better than non liposomal local anesthetic and may be a useful adjunct during unilateral transforaminal lumbar interbody fusion for decreasing pain and narcotic consumption in the first 24 hours after surgery and may also decrease the overall length of stay (1 day less in study group). Parecoxib and ketorolac are potent non-opioid NSAIDs that are attractive alternative drugs to opioids to avoid opioid-related side effects. When comparing parecoxib (40 mg), ketorolac (30 mg) and placebo (saline solution) in patients undergoing lumbar spinal fusion, it was found that both groups showed significantly better early post-operative pain reduction at the postanesthesia care unit than control group. There were no differences between the pain scores of ketorolac and parecoxib at any time point. Complications and bleeding were not significant different between all three groups. In patients undergoing an instrumented one-level posterolateral lumbar spondylolisthesis under spinal anesthesia, patients who received 15 mg of hyperbaric bupivacaine with 5 μg of dexmedetomidine in L3–4 intervertebral disc space had better satisfaction scores, longer sensory and motor regression times and longer time to the first requirement of analgesia than the 15 mg of hyperbaric bupivacaine only. However in patients undergoing a more than three levels of thoracic and/or lumbar spine surgery with application of dexmedetomidine 1 μg/kg followed by a continuos infusion of 0.5 μg/kg/h versus placebo there was no difference in postoperative opioid consumption or improve pain scores after multilevel deformity correction spine surgery. The traditional approach to hallux valgus surgery is often connected with significant postoperative pain. In a clinical trial comparing bupivacaine and lidocaine wound infiltration (4 mL of 0.25% bupivacaine and 3 mL of 2% lidocaine) and placebo in patients undergoing surgery for hallux valgus (chevron or a minimal invasive Mitchell-Kramer procedure) there was less pain during the first 24 hours after surgery (significantly lower VAS score ) in the group of the wound infiltration. A systematic review of randomized controlled trial assessing postoperative pain after foot and ankle surgery with approaches included peripheral nerve blocks, wound infiltration, intravenous dexamethasone, acetaminophen, non-steroidal anti-inflammatory drugs, cyclooxygenase-2 selective inhibitors and opioids demonstrated that optimal pain management strategies included loco-regional analgesic techniques plus acetaminophen and NSAIDs or cyclooxygenase-2 selective inhibitors with opioid's used for rescue and single intraoperative dose of parental dexamethasone. It is an optimal pain management regimen when expecting moderate postoperative pain. Popliteal sciatic nerve blocks would be appropriate when expecting severe postoperative pain. One study in which patients with femoral neck fractures required surgical treatment with two parallel hook pins after reduction of fracture in a clinical trial compared placebo with ropivacaine distributed intra-articular and extra-articular in soft tissues and found no significant difference in the consumption of opioid rescue medication and no significant difference in pain measures. Patients undergoing surgery for femoral fracture with a broad range of fracture patterns (plate fixation, intramedullary device or arthroplasty) were randomized either to receive an intraoperative, surgical-site injection into the superficial and deep tissues containing ropivacaine, epinephrine, and morphine or to receive no injection. The injection group demonstrated significantly lower VAS scores than the control group at 4, 8 and 12 postoperative hours. Narcotic consumption was significantly lower in the injection group (5.0 mg) compared with the control group (9.7 mg) over the first 8 hours after the surgical procedure. Another study in patients with femoral fractures found that when comparing FNB using stimulator with 0.2% ropivacaine and intravenous fentanyl 0.5 μg/kg before patient positioning for fracture femur surgery VAS at 2 minutes was better in FNB group, satisfaction score was better in FNB group, the post operative VAS scores were lower in FNB group and the frequency of epidural top-ups was higher in fentanyl group. Pain is a non-desired effect of every surgery. Orthopedic surgery is increasing in every day over the world followed by the increasing of people's life expectancy and so are the orthopedic degenerative diseases such as arthritis (most commonly knee, hip and shoulder), disc degeneration and carpal tunnel syndrome. Therefore people are at risk of having post-surgical pain. There are a lot of techniques to prevent post-surgical pain having in preemptive analgesia one of the most efficient techniques compared with post-surgical techniques and traditional techniques. The studies show that the application of this techniques before incision or during the approach combined with at closure techniques have the best rate of success in lowing pain in the immediate post-surgical state. Preemptive analgesia can be since regional blockade and local wound infiltration before incision to application of oral or intravenous medication before beginning surgery (nsaids, gabapentin, pregabalin, dextromethorphan, melatonin, multimodal and opioids) and the new approaches like transcutaneous electrical nerve stimulation. The majority of studies in the orthopedic surgery have a higher rate of post-surgical pain such as spine surgery with or without fusion and arthroplasty (most commonly knee, hip and shoulder) as shown in [Table 1]. This kind of surgery has the characteristic that pain in post-surgical state is often a problem because they need more doses of opioids and rehabilitation is delayed. Little is reported on trauma surgery just finding studies in femoral fractures. There is a possibility that in fracture surgery the stabilization has a valuable effect on post-surgical pain without the compromise of bone damaging the soft structures and without luxation of affected articulations. However more studies are needed in order evaluate the real effect of preemptive analgesia in specific fractures and patterns so evaluate the cost and benefit of these approaches in specific lesions. Preemptive analgesia has an important role in diminishing the pain rate in the post-surgical state and can improve the patient satisfaction and early mobilization. When the surgeon expects moderate to severe pain the rb with consideration of complicated technique and sometimes requirement of special devices is recommended, which has better pain response and a delayed rehabilitation in first hours. If the surgeon expects low to moderate post-surgical pain local wound infiltration with or without oral and intravenous drugs is recommended. Considering that these are easier techniques and provide good pain relief in the first hours of the post-surgical state, anyway more studies are needed so that the specific application can be demonstrated. Amiri HR, Mirzaei M, Beig Mohammadi MT, Tavakoli F. Multimodal preemptive analgesia with pregabalin, acetaminophen, naproxen, and dextromethorphan in radical neck dissection surgery: a randomized clinical trial. Anesth Pain Med.2016;6:e33526. Hutchison RW. Challenges in acute post-operative pain management. Am J Health Syst Pharm. 2007;64:S2-5. Kehlet H, Jensen TS, Woolf CJ. Persistent postsurgical pain: risk factors and prevention. Lancet. 2006;367:1618-1625. Bossmann T, Brauner T, Wearing S, Horstmann T. Predictors of chronic pain following total knee replacement in females and males: an exploratory study. Pain Manag. 2017;7:391-403. Beaussier M, Sciard D, Sautet A. New modalities of pain treatment after outpatient orthopaedic surgery. Orthop Traumatol Surg Res. 2016;102:S121-124. Huang Y, Chiu F, Webb CA, Weyker PD. Review of the evidence: best analgesic regimen for shoulder surgery. Pain Manag. 2017;7:405-418. Panigrahi R, Roy R, Mahapatra AK, Prasad A, Priyadarshi A, Palo N. Intra-articular adjuvant analgesics following knee arthroscopy: comparison between single and double dose dexmedetomidine and ropivacaine a multicenter prospective double-blind trial. Orthop Surg. 2015;7:250-255. Rosero EB, Joshi GP. Preemptive, preventive, multimodal analgesia:what do they really mean? Plast Reconstr Surg. 2014;134:85S-93S. Moucha CS, Weiser MC, Levin EJ. Current strategies in anesthesia and analgesia for total knee arthroplasty. J Am Acad Orthop Surg. 2016;24:60-73. Ahiskalioglu EO, Ahiskalioglu A, Aydin P, Yayik AM, Temiz A Effects of single-dose preemptive intravenous ibuprofen on postoperative opioid consumption and acute pain after laparoscopic cholecystectomy. Medicine (Baltimore). 2017;96:e6200. Arumugam S, Lau CS, Chamberlain RS. Use of preoperative gabapentin significantly reduces postoperative opioid consumption: a meta-analysis. J Pain Res. 2016;9:631-640. Bafna U, Rajarajeshwaran K, Khandelwal M, Verma AP. A comparison of effect of preemptive use of oral gabapentin and pregabalin for acute post-operative pain after surgery under spinal anesthesia. J Anaesthesiol Clin Pharmacol. 2014;30:373-377. Węgorowski P, Stanisławek A, Domżał-Drzewicka R, Sysiak J, Rząca M, Milanowska J, Janiszewska M, Dziubińska A. The effect of pre-emptive analgesia on the level of postoperative pain in women undergoing surgery for breast neoplasm. Contemp Oncol (Pozn). 2016;20:158-164. Beigom Khezri M, Delkhosh Reihany M, Oveisy S, Mohammadi N. Evaluation of the analgesic efficacy of melatonin in patients undergoing cesarean section under s pinal anesthesia: a prospective randomized double-blind study. Iran J Pharm Res. 2016;15:963-971. Wang N, Wang L, Gao Y, Zhou H, Wang J. Analgesic effect of preoperative pentazocine for laparoscopic cholecystectomy. Cureus. 2016;8:e948. Singh S, Prasad C. Post-operative analgesic effect of dexmedetomidine administration in wound infiltration for abdominal hysterectomy: a randomised control study. Indian J Anaesth. 2017;61:494-498. Eidy M, Fazel MR, Janzamini M, Haji Rezaei M, Moravveji AR. Preemptive analgesic effects of transcutaneous electrical nerve stimulation (TENS) on postoperative pain: a randomized, double-blind, placebo-controlled trial. Iran Red Crescent Med J. 2016;18:e35050. Hu B, Lin T, Yan SG, Tong SL, Yu JH, Xu JJ, Ying YM. Local in filtration analgesia versus regional blockade for postoperative analgesia in total knee arthroplasty: a meta-analysis of randomized controlled trials. Pain Physician. 2016;19:205-214. Jianda X, Yuxing Q, Yi G, Hong Z, Libo P, Jianning Z. Impact of preemptive analgesia on inflammatory responses and rehabilitation after primary total knee arthroplasty: a controlled clinical study. Sci Rep. 2016;6:30354. Munteanu AM, Cionac Florescu S, Anastase DM, Stoica CI. Is here any analgesic benefit from preoperative vs. postoperative administration of etoricoxib in total knee arthroplasty under spinal anaesthesia? : a randomised double-blind placebo-controlled trial. Eur J Anaesthesiol. 2016;33:840-845. Barastegui D, Robert I, Palau E, Haddad S, Reverte-Vinaixa M, Lorente L, Cots M. Can local infiltration analgesia increase satisfaction in postoperative short-term pain control in total knee arthroplasty? J Orthop Surg (Hong Kong). 2017;25:2309499017690461. Pinsornsak P, Nangnual S, Boontanapibul K. Multimodal infiltration of local anaesthetic in total knee arthroplasty; is posterior capsular infiltration worth the risk? A prospective, double-blind, randomised controlled trial. Bone Joint J. 2017;99-B:483-488. Mao Y, Wu L, Ding W. The efficacy of preoperative administration of gabapentin/pregabalin in improving pain after total hip arthroplasty: a meta-analysis. BMC Musculoskelet Disord. 2016;17:373. Jia XF, Ji Y, Huang GP, Zhou Y, Long M. Comparison of intrathecal and local infiltration analgesia by morphine for pain management in total knee and hip arthroplasty: a meta-analysis of randomized controlled trial. Int J Surg. 2017;40:97-108. Villatte G, Engels E, Erivan R, Mulliez A, Caumon N, Boisgard S, Descamps S. Effect of local anaesthetic wound infiltration on acute pain and bleeding after primary total hip arthroplasty: the EDIPO randomised controlled study. Int Orthop. 2016;40:2255-2260. Namdari S, Nicholson T, Abboud J, Lazarus M, Steinberg D, Williams G. Randomized controlled trial of interscalene block compared with injectable liposomal bupivacaine in shoulder arthroplasty. J Bone Joint Surg Am. 2017;99:550-556. Ahn S, Byun SH, Park K, Ha JL, Kwon B, Kim JC. Analgesic efficacy of preemptive pregabalin administration in arthroscopic shoulder surgery: a randomized controlled trial. Can J Anaesth. 2016;63:283-289. Entezary SR, Farshadpour S, Alebouyeh MR, Imani F, Emami Meybodi MK, Yaribeygi H. Effects of preoperative use of oral dextromethorphan on postoperative need for analgesics in patients with knee arthroscopy. Anesth Pain Med. 2013;4:e11187. Mardani-Kivi M, Karimi Mobarakeh M, Keyhani S, Haghighi M, Hashemi-Motlagh K, Saheb-Ekhtiari K. Arthroscopic bankart surgery: does gabapentin reduce postoperative pain and opioid consumption? A triple-blinded randomized clinical trial. Orthop Traumatol Surg Res. 2016;102:549-553. Shlaifer A, Sharfman ZT, Martin HD, Amar E, Kazum E, Warschawski Y, Paret M, Brill S, Drexler M, Rath E. Preemptive analgesia in hip arthroscopy: a randomized controlled trial of preemptive periacetabular or intra-articular bupivacaine in addition to postoperative intra-articular bupivacaine. Arthroscopy. 2017;33:118-124. Kumar S, Palaniappan JM, Kishan A. Preemptive caudal ropiva caine: an effective analgesic during degenerative lumbar spine surgery. Asian Spine J. 2017;11:113-119. Kim J, Burke SM, Kryzanski JT, Roberts RJ, Roguski M, Qu E, Hwang SW, Liu PP, Desilier A, Riesenburger RI. The role of liposomal bupivacaine in reduction of postoperative pain after transforaminal lumbar interbody fusion: a clinical study. World Neurosurg. 2016;91:460-467. Siribumrungwong K, Cheewakidakarn J, Tangtrakulwanich B, Nimmaanrat S. Comparing parecoxib and ketorolac as preemptive analgesia in patients undergoing posterior lumbar spinal fusion: a prospective randomized double-blinded placebo-controlled trial. BMC Musculoskelet Disord. 2015;16:59. Salem RA, Darweesh EI, Wanis MA, Mohamed AA. Evaluation of the effects of intrathecal bupivacaine-dexmedetomidine for lumbar spine fusion: a double blinded randomized controlled study. Eur Rev Med Pharmacol Sci. 2015;19:4542-4548. Naik BI, Nemergut EC, Kazemi A, Fernández L, Cederholm SK, McMurry TL, Durieux ME. The effect of dexmedetomidine on postoperative opioid consumption and pain after major spine surgery. Anesth Analg. 2016;122:1646-1653. Gądek A, Liszka H, Wordliczek J. Postoperative pain and preemptive local anesthetic infiltration in hallux valgus surgery. Foot Ankle Int. 2015;36:277-281. Wang J, Liu GT, Mayo HG, Joshi GP. Pain management for elective foot and ankle surgery: a systematic review of randomized controlled trials. J Foot Ankle Surg. 2015;54:625-635. Singh AP, Kohli V, Bajwa SJ. Intravenous analgesia with opioids versus femoral nerve block with 0.2% ropivacaine as preemptive analgesic for fracture femur: a randomized comparative study. Anesth Essays Res. 2016;10:338-342. JLV and AKL prepared, edited, and approved the final version of the manuscript.